I enjoy my early mornings very much. It was not something that I felt was for me before (after my kids that is), but they truly are. As a mother who stays home with her children, I am always surrounded by my little joys and would not have it any other way. This does not mean that I do not enjoy or deserve a little me time that involves my own personal development and growth. It's true. 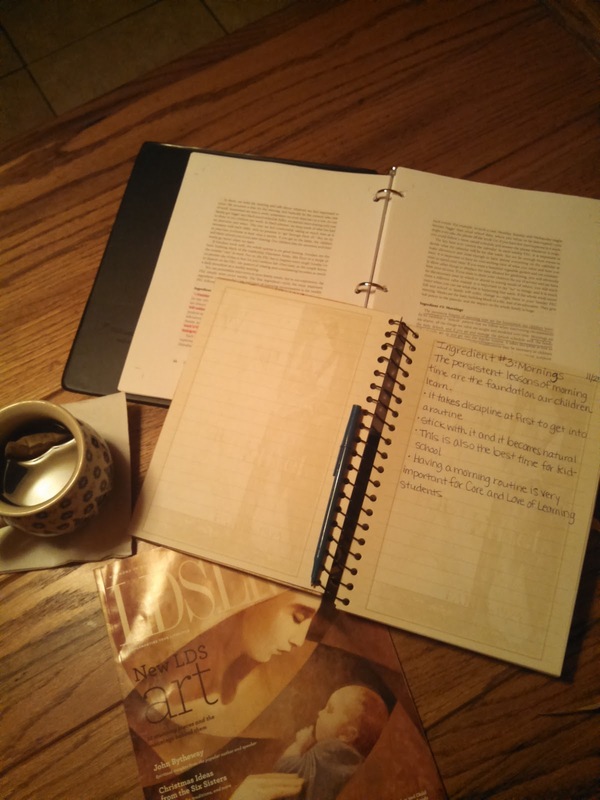 I have found that during this time when my children are still asleep, it has been the perfect time for me to have prayer, scripture study, read, study and this morning blog. Since I have started this routine for myself, it has opened new doors and insights for my children. I have set an example. A great one indeed, where my children get up and grab books or do other activities that I feel work for our family unit. of course, there are mornings where I have started a few chores and then my children will grab their clothes to start sorting out their laundry, ask to start dusting or to do something else to help me before I get breakfast ready. For me, these are a part of academics. I want my children to know and see how important family is and know that for us it is valued with such importance. My son is reading more now and likes to bring a book he is reading to the kitchen table and sit beside me. Immediately, I will stop what it is I am reading or doing to give him full attention and to help him sound out words that he might need help with. This is important to me, as I want my children to know that I value the great choices they make. It is that same as if they were making a not so good choice and I stop to explain why we do not make those kinds of choices. Besides, I am working on a better groove for our afternoons, that will allow myself thirty minutes of personal time. My twin girls are very high energy and we have been working on the importance of quiet time. Everyone, no matter our age, not could use, but need some form of quiet time. I am a believer. Mornings help me to have a better day all around and in return help my children to have a better day too. In Leadership Education: The Phases of Learning by Oliver and Rachel DeMille, you will learn about the ingredients. Ingredient #3: Mornings is what I reread this morning. The book is a classic and I find myself coming back to the TJED books often. This ingredient can be found on page 67 and I wanted to share a few quotes that stood out to me this morning. "The persistent lessons of morning time are the foundation our children learn." "Mornings are the daily default, and if you set and manage the default schedule well, the family will naturally get up and get into the regular routine." "It takes discipline at first to get the routine established, and again modifications may be necessary as children move through phases and seasons change." "Morning is, for most families, the best time or Kidschool." There is so much more valuable information regarding this ingredient and if you have not read it, please do! I only gave you a taste! You amaze me by beautiful daughter-in-law. I don't know how you do it. I am grateful for the wonderful mother you are to my grandchildren and a dedicated wife to my son. Thank you so much mom. I strive to be a better mother and wife every day. Best part of this whole post, the comment from your mother in law at the end. Beautiful. Thank you, Rachel! I am very lucky to have such a wonder and supporting mother-in-law! I am not sure how I just saw your comment, but thank you for stopping by.